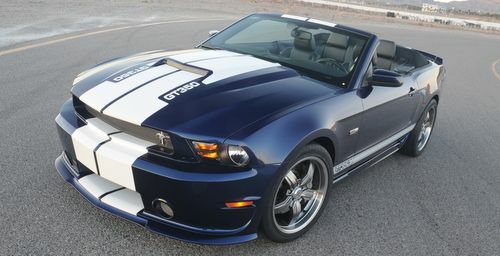 The 2012 Shelby GT350 is a Ford GT convertible with a boost of steroid-like power that delivers a jaw-dropping optional 624 horsepower – all while letting the sun shine in. The normally aspirated version turns in a mid-12-second ¼ mile via 525 horsepower while the supercharged Shelby GT is going to snap you back in the seat while completing the ¼ mile in about 11.5 seconds. Not only is the Shelby GT350 fast from 0-60 but it also demonstrates amazing stopping power from 60 down to 0. According to the presentation made at the Chicago Auto Show press days, the GT350 comes to a screeching halt courtesy of six-piston front brakes and Eradispeed rear rotors in 107 feet. That’s faster than stopping on a dime. The optional polished supercharger under the hood in the 624 horsepower Shelby/Ford Racing/Whipple version is just a thing of beauty. The true beauty, though, is this engine meets 50-state emission laws and uses normal gas station fuel. No need to fuel up at your local hot rod filling station. The beauty continues on the outside. The rear fascia uses 1967-69 style rear backup lights. The bright back center exit exhaust is both a visual and aural pleasure with its exhaust note tuned to replicate that of the Shelby from 1965. It’s impossible not to grin when hearing the RPMs raised as the accelerator is depressed and the burble fills the inside of McCormick Place. Of course, all of this beauty comes with a price. First you need to purchase a Mustang GT350 and then fork over $26,995 to Shelby to get the naturally-aspirated version with its 525 horsepower. Pony up $33,995 and the supercharged Shelby comes to you via its headquarters in Las Vegas. Check off all the options and you could end up dropping almost $90,000 when all is said and done. But at least you would be the owner of one of only 350 of the Shelby GT350s that will be made in 2012.